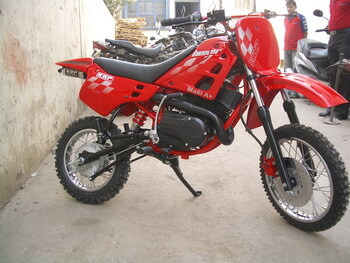 BASED ON RX100/LIBERO/CALIBER ENGINE WITH RE-DESIGNED & STRENGTHED TUBULAR FRAME FOR EXTRA STENGTH. 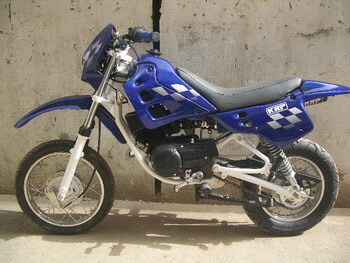 This bikes is based on the plateform & engine of the RX100 / Libero / Caliber. 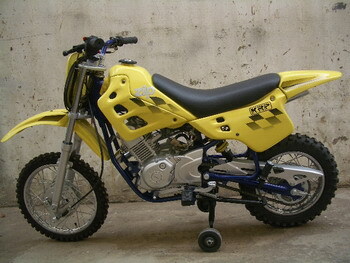 Body Kit: Newly designed by KRP to look like the small version of the big off-road bikes. The GRP Body Kit has been moulded in-house at KRP facility with the best quality woven material for better strength & finish. 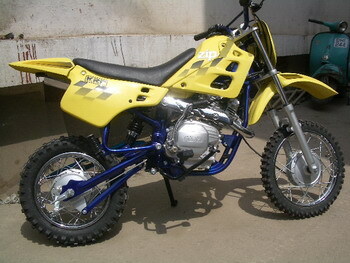 The fuel tank capacity is of 6 ltrs. Wheels: Front wheel is 14" & Rear Wheel is 12"
Engine: Yamaha RX 100 with KRP Exhaust Charger fitted to it for better power output.